The white arrow points to one of the "claws", actually hammers. 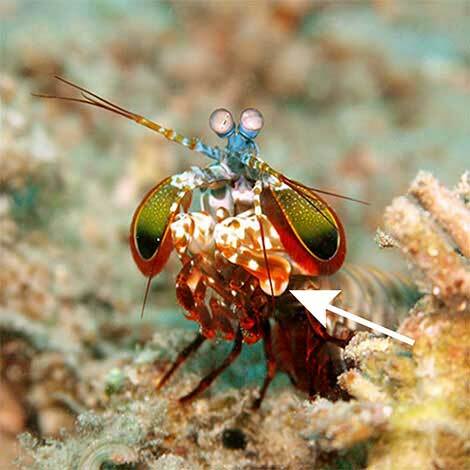 Photo of peacock mantis shrimp (Odontodactylus scyllarus) taken by Jens Petersen at Tasik Ria house reef, Manado, Indonesia and kindly shared via Winkipedia. This very approximate schematic diagram shows the layered structure of the hammer. The outer layers are packed crystals of hydroxyappitite (the red rectangles). 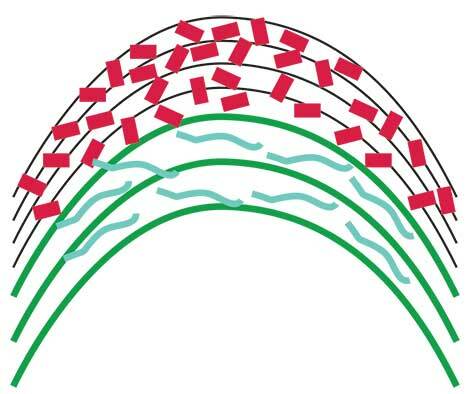 The inner layers are arrays of long polymers of N-acetyl glucosamine (the blue-green squiggles). This month's essay was motivated by the article: "The Stomatopod Dactyl Club: A Formidable Damage-Tolerant Biological Hammer" , and preview of that article "Small but Extremely Tough" . Unfortunately this article is not "open access", so you must have a subscription to Science, or access to a library that has one, or wait 6 months after the publication date to get free Internet access. Also unfortunately the peacock shrimp doesn't live on my dock; I would love to see it. But maybe someday you will travel to Indonesia. The photos from Wikipedia are so spectacular that I will have done a service by just alerting you to them (on the actual Wikipedia page you have access to a very large high resolution image). This shrimp preys on animals with hard shells, e.g. mussels and clams. It cracks and opens the shells by pounding on them with its modified claws, which have been reduced to clubs. To be effective the claws must have very powerful and fast contracting muscles. In addition the shell of the claw must be much tougher than the shells it cracks. The basic plan for the claw shell is layers of material that each provide an important function. The outer layers are packed crystals (or gains) of hydroxyappitite (HA), a precise mixture of calcium and phosphate. HA is a major constituent of bone and teeth enamel. While it is hard, if subject to extreme stress it can fracture between the grains. This is a common problem with all hard materials, e.g. metals ,which are also composed of small grains. The common solution to control fractures in hard materials is to imbed them materials that, while not hard, have good tensile strength. For concrete this is can be steel rebar. For the shrimp claw the material that holds the HA crystals together is layers of a polymer of modified glucose molecules: N-acetyl-glucosamine. The claw, or hammer, of the peacock shrimp contains layers of different materials that give it extreme strength and the ability to crack the shells of mollusks and crustacians. The outer layer is hard calcium phosphate, the inner layers are composed of modified glucose polymers. Small but extremely tough. Science, 8 June, 2012, Vol 336 pg 1237. The Stomatopod Dactyl Club: A Formidable Damage-Tolerant Biological Hammer. Science, 8 June, 2012, Vol 336 pg 1275.